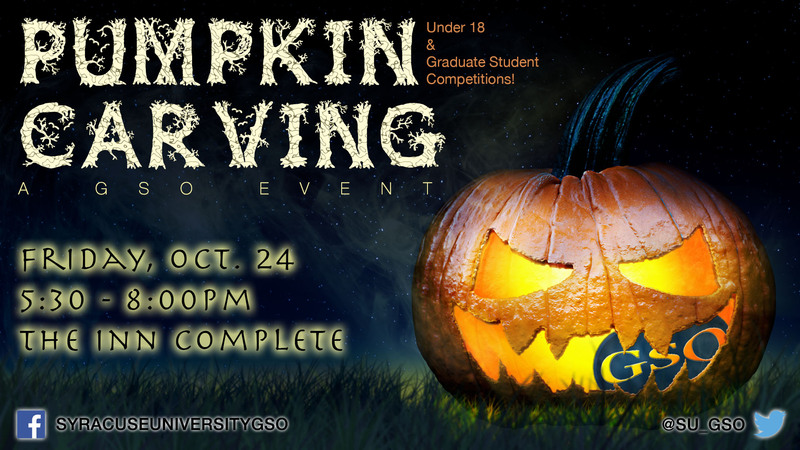 We’re having a Pumpkin Carving Event for graduate students and their families! Due to the limited number of pumpkins we have, we will give out pumpkins on a first come, first served basis! Please fill out the RSVP form below. Where? The event will take place at The Inn Complete in SU South Campus (map below). When? Friday, October 24 between 5:30 – 8:00pm. What? We will have two contests: under 18 and graduate student. We have a limited supply of pumpkins, so RSVP now and reserve yours, or better yet, bring as many pumpkins as you like and get carvin’! Pumpkins will be given out on a first come, first served basis while supplies last. UPDATE (Friday, Oct. 24): We received so many RSVPs — yay! Thanks to everyone who responded! RSVP form is now closed. Don’t forget — PUMPKINS WILL BE GIVEN OUT ON A FIRST COME, FIRST SERVED BASIS!